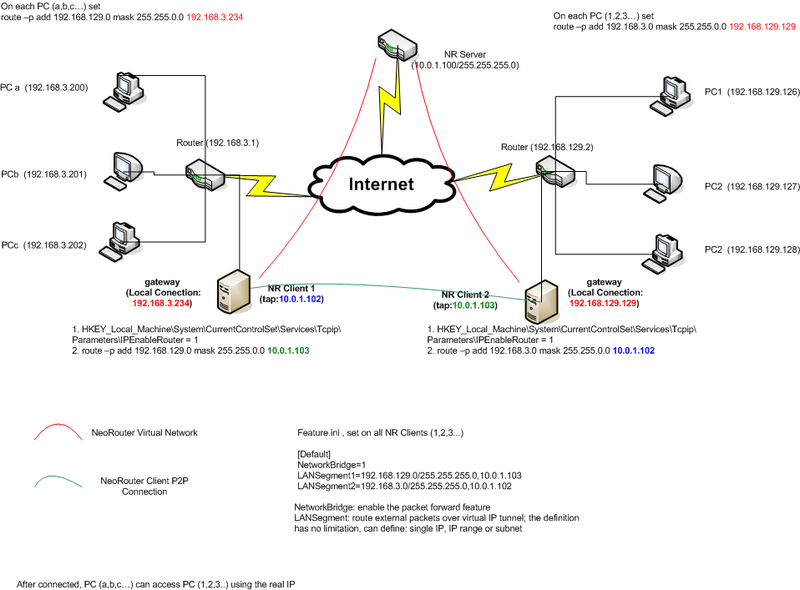 NeoRouter :: View topic - site to site VPN -- how many computers are needed? site to site VPN -- how many computers are needed? Post subject: site to site VPN -- how many computers are needed? I am thinking about using NeoRouter to setup up a site-to-site VPN. In looking at the Network Bridge photo at the Wiki, how many dedicated computers do I need? Looks like I need 3? Computer-1: NRServer --> Where shall this computer be physically located? Can it be at one of the site? The photo looks like it is at the 3rd site. Any help or advise will be greatly appreciated. Thank you. Post subject: Re: site to site VPN -- how many computers are needed? Since v2.0, NR doesn't support network bridge features (site-to-site) anymore. If you want to try, use v1.x NR clients. Since it's a client side feature, NR server can be setup anywhere wherever NR clients can connect to. Then on each site, need a NR client as a gateway. I will use V1.X for client. As of the NRserver side, shall I use 1.X or 2.0?